The National Park Service (NPS) has announced the signing of the Yellowstone Winter Use Plan Record of Decision by Intermountain Regional Director John Wessels. The ROD officially completes the Winter Use Plan/Supplemental Environmental Impact Statement (SEIS) process. 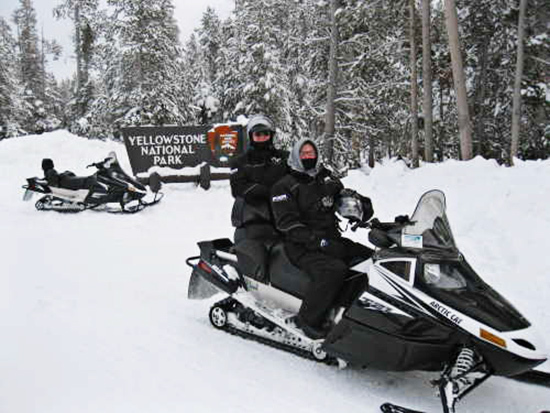 The ROD assures continued access to Yellowstone in Winter by both snowmobiles and snowcoaches. There remains one final step in the current Winter Use planning effort by the Park Service. That step is the creation of a “New Regulation” to implement the ROD. That new regulation should be published in the Federal Register in late September, 2013. The new regulation comes with one concern that I will cover at the end of the Good News part of this article. And now for the Good News. The ROD for Winter Use shows that our collective comments on the “Proposed Rule”, which ended June 17, 2013 have been heard. The ROD will provide a framework for more effectively managed access for snowmobiles and snowcoaches in Yellowstone National Park while minimizing impacts on visitors, air/sound quality, and wildlife. The final regulation, yet to be released, will guide management of winter use in the Park and will implement the preferred alternative from the Final SEIS. Under the Record of Decision, the winter of 2013/2014 will be a transition year during which the Park will allow motorized over-snow travel under the same conditions in place for the past four winters. Up to 318 commercially guided Best Available Technology (BAT) snowmobiles and up to 78 commercially guided snowcoaches will be allowed daily. Starting in the 2014/2015 Winter season the Park would permit up to 110 “transportation events” daily, initially defined as one snowcoach or a group of up to 10 snowmobiles, averaging seven snowmobiles per group per season. Up to 50 transportation events may be groups of snowmobiles. Management by transportation events is an impact-centric approach designed to minimize the impact of oversnow vehicles (OSVs) on air quality, soundscapes, and wildlife rather than focusing solely on the number of vehicles entering the Park. This new, practical approach to OSV management by “transportation events” will provide greater flexibility for OSV commercial tour operators, reward future OSV technological innovations, and reduce OSV-caused environmental impacts, all while making the Park cleaner and quieter than previously authorized. Another important part of the ROD is that four transportation events per day (one per gate) would be reserved for non-commercially guided snowmobile access and Sylvan Pass would continue to be operated in accordance with the Sylvan Pass Working Group Agreement. The non- commercially guide access will provide snowmobilers a change to visit their Park without hiring a commercial guide. Now, our remaining concern. BlueRibbon and it’s Winter Use partners will be watching the new regulation’s treatment of BAT for snowmobiles. The ROD for the first time describes the timeline for NEW BAT standards as “beginning no later than the 2017-2018 winter season.” This seemingly creates the potential for a decision to require NEW BAT compliance earlier than the previously-announced 2017-2018 season. There are scenarios in which a hastily considered or poorly timed effort to prematurely implement NEW BAT requirements could threaten future access to the Park. We will remain watchful and vigilant to protect against this possibility. BlueRibbon will provide current information as it becomes available at our dedicated website – www.saveyellowstonepark.com. Additional information and a electric copy of the Plan/SEIS and ROD are available online at http://parkplanning.nps.gov/yell.